men increasingly coming in on the act. It’s a huge market worth billions but this is beauty at a (potential) cost to health. However, natural strategies may help. In this exclusive extract from their new book, The Ultimate Natural Beauty Bible, Sarah Stacey and Jo Fairley offer some suggestions. We colour our hair. We have done for years and almost nothing would persuade us to change because we love the results. Jo has lots of blonde in her naturally dark hair – her mop is nearly as fair now as when she was a toddler – and Sarah has caramel and blonde tones in her dark hair, plus a ‘permanent’ tint to cover her partial grey. And that tint is more likely to be the problem, according to research. Two of the most commonly used ingredients in tints – PPD (para-phenylenediamine) and PTD (para-toluenediamine) – are known contact allergens, which have ‘excellent skin penetration qualities’, according to consultant dermatologist Dr David Orton, a leading researcher. They may cause allergic eczema-type reactions – redness, itching and possible blistering of the face and scalp – also swelling and, very rarely, hair loss. In rare cases, reactions including asthma, contact urticaria and anaphylactic shock have been reported. However, the problem is not limited to PPD, which was first patented in 1883 and now features in up to 90 per cent of hair colours with higher concentrations in darker colours. There are, in total, 27 chemicals listed as skin sensitisers in one report by the European Commission: ten extreme, 13 strong and four moderate. The number of people affected is tricky to establish. According to proceedings from the European Academy of Dermatology and Venereology Conference 2013, 1% suffers an allergic reaction. But, according to other data, the number suffering some adverse hair dye reactions is much higher. In one UK questionnaire-based survey, nearly half the 1,800 subjects had used hair dye once or more, mostly women who had first tried colouring their hair around 25. Of those, 14 per cent reported developing eczema-type reactions, with three per cent saying they had experienced swelling under the skin. Interestingly, most of the respondents coloured their hair blonde, or had highlights; fewer used dark brown or black dyes, which contain more PPD. (This reflected the ethnic mix of the respondents.) Over half had their hair coloured professionally. Temporary henna tattoos, where PPD is added (sometimes in amounts of 20 times that advised by manufacturers) to give a deeper, more lasting black dye appear to make users more likely to have allergic reactions to hair dye containing PPD. ‘These tattoos really are best avoided,’ says Dr Orton. Although consumer self (patch) testing has been held out as the key safety measure for consumers, few people do it and theoretically it may increase the risk of sensitisation. The validity of the results is now considered so unreliable that the SCCS (Scientific Committee on Consumer Safety) may now recommend the current test is discontinued. Try the natural hair care and recipes in our book: they won’t have the same effect as hair dyes but they will enhance the condition and appearance, which you might find is quite good enough. Colour your hair with conventional products as seldom as possible: we know the temptation of keeping the colour fresh but try to limit colouring sessions to every six to eight weeks rather every one to four. And opt for blonde highlights rather than dark tints if possible. Fill in roots and soup up lights with a product like Color Wow!, a mineral powder-based brush-on powder that is very clever indeed. Don't use hair dye to colour your eyelashes. Your eyes are precious and we have first hand experience of allergic reactions. Also: avoid black henna tattoos. Try this nutritional ‘cocktail’. Dr Paula Baillie-Hamilton, a researcher into environmental chemicals, recommends the following measures to help protect against the risks of hair dye. About half an hour before your appointment, take extra antioxidant vitamins C (1g) and E (400iu) plus soluble fibre as psyllium husks (3g), in addition to your usual supplements. Take another 500mg vitamin C as soon as possible afterwards. If you do have a reaction of any kind, seek medical help. Ask for patch testing to confirm the cause and to exclude allergy to cross-reacting chemicals. Watch out for new developments: at least one leading company (Wella Professionals) is soon to launch a formula, which is ‘significantly’ less likely to cause an allergic reaction. And new patch tests may also be available. 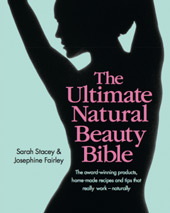 The Ultimate Natural Beauty Bible is out now, from Amazon and all good bookshops.